I know I’ve already shared a Risotto Milanese recipe with you, and in many ways this Saffron and Butternut Squash Risotto is similar. But there are a number of key changes that set it apart, make it worth its own post. The obvious change, the addition of butternut squash, makes this dish even heartier, and even more appropriate for Fall. I also added some leftover shredded chicken to make it even more of a meal in one, but without it the risotto is a great vegetarian main or side. The other big change I made here is to use a mix of the usual arborio rice and barley. The barley adds a chewy texture, while the arborio rice becomes creamy with constant stirring. My husband declared it the best risotto he’d ever eaten, citing the barley as the game changer. Of course, you can use all arborio rice for the usual experience, as well as a naturally gluten free risotto (barley contains gluten). For an even chewier risotto you can also use all barley. I’ve used both pearl and hulled barley in risotto and while pearl barley is supposed to cook faster, I actually prefer hulled. But use whichever you prefer and have available. Paolo from Disgraces on the Menu gave me a great risotto-making tip: make sure the stock is hot. This will ensure the risotto cooks evenly and quickly. Although recipes usually call for this I got a little lazy with keeping the stock warm and I can tell you it really makes a difference. This recipe was originally inspired from an Ina Garten recipe on Food Network. For another awesome Saffron Risotto with Butternut Squash check out Sandra’s version on Sandra’s Easy Cooking! This risotto is heartier than Risotto Milanese and perfect for Fall. Add shredded chicken for an even heartier meal, or omit it for a vegetarian main. Place the squash on a pan and toss with the olive oil, salt, and pepper. Roast for 25 to 30 minutes, tossing once, until very tender. Set aside. Meanwhile, bring the stock to a simmer in a small saucepan. Leave it on low heat. Soak the saffron in a tablespoon or two of hot stock and allow to infuse. In a heavy-bottomed pot or Dutch oven, melt 4 tablespoons of the butter and saute the onions on medium-low heat for 10 minutes, until the onions are translucent but not browned. Add 2 full ladles of stock to the rice plus the saffron, and season with salt and pepper. Stir, and simmer until the stock is absorbed, 5 to 10 minutes. Continue to add the stock, 2 ladles at a time, stirring every few minutes. Each time, cook until absorbed, then add more stock. Continue until the rice and barley are cooked through, but still al dente, 30 to 40 minutes total. Add the roasted squash cubes and chicken, if using, and stir to combine. Remove from the heat and stir in the Parmesan cheese and remaining 2 tablespoons butter. Mix well and serve. Omg..when you said you were writing a post for Monday about this I couldn’t believe:)) this looks awesome..pearl barley sound fantastic mixed with rice..I do sometimes use it as an alternative for my risotto, but never together. Have to try it though! Thanks for the mention, you are sweetheart! Wow, Katherine, this risotto looks amazing!!! Your risotto looks the perfect consistency – beautifully thick and creamy.Love the addition of pearl barley, and the saffron adds such beautiful colour. Just gorgeous. Thank you! The barley really did give it a nice texture. And I love saffron! Haha thank you!!!! I’ve been so into barley lately! I also made a beet and barley risotto recently, also very good! Katherine this looks so good. I must try this one. I picked up saffron at a market awhile back so now I have a use for it. Just gorgeous! Thank you Kim! I hope you enjoy 🙂 Risotto is a great use for saffron! What a complement!!! I also love saffron and risotto, and the squash made it extra hearty, cozy, and fall-like. Ditto all the comments on how beautiful this looks! I have saffron waiting patiently in the cupboard for a recipe-I am now inspired! Thanks!!! I am so happy to have inspired you! 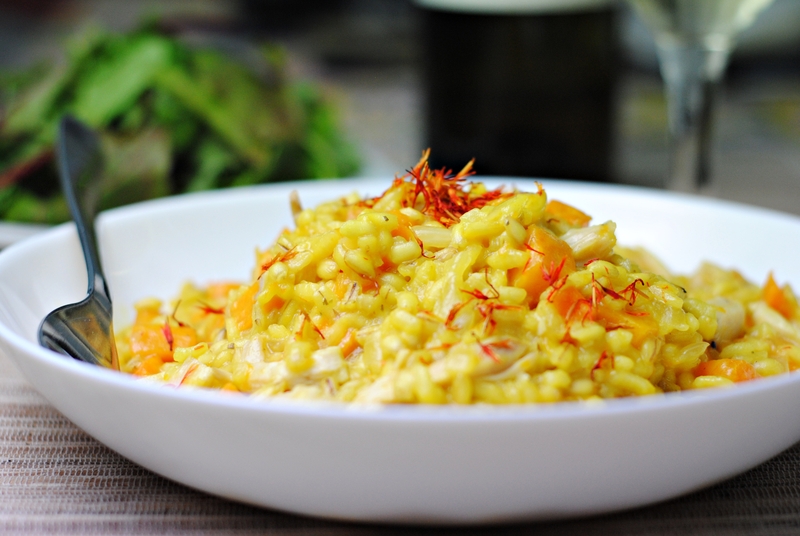 I absolutely love saffron in risotto, the flavor really comes through. Can’t wait to see what you end up making! Particularly nice pictures in this post! Love the idea of barley – goes well with the rice, and sound like a perfect combo with the squash. Really, really tasty sounding recipe. Thanks, and Happy Thanksgiving! Thank you!!! I am so happy you like it. I wasn’t sure how the barley and rice would work together (I read in a few places it can be problematic because of different cooking times) but I thought they played off each other so nicely. I also made a risotto just with barley recently and I have to say I think I like the mix best. Happy Thanksgiving to you as well!! Butternut squash risotto is my favorite…I love that you added saffron. Can’t wait to try that, I love making risotto! Thank you!! I love making risotto because there is so much room to play. The saffron and squash were really nice together. You are too sweet! I’m totally blushing 😀 The squash did indeed give the risotto even more great texture. First Sandra and now you, this looks beautiful Katherine! I really love how creamy this looks. I believe you saffron and squash (along with rice) sounds awesome! Haha I know! I couldn’t believe when I saw a similar risotto on Sandra’s site the other day, as I was literally writing up this post. Great minds think alike 😉 Thank you Nami! It was creamy with a wonderful texture. It was! Squash in risotto is just delicious, I hope you’ll give it a try some time! Oooh, I bet the barley is lovely in this. What a great idea to mix some in for added texture and surprise. Thank you Carolyn! Yes, the barley really did add a little oomph and textural contrast. Well said! I agree, it’s so cozy! This risotto looks amazing! Would love get a big plate of that.